When family and friends were visiting Estes Park in early August, we were envious and decided that we needed to go out there, too! We contacted a cottage owner and were able to get reservations for Labor Day week. We arrived on Sunday, September 1 and left on Saturday morning, September 7. We drove over Trail Ridge Road, over Fall River Road noting that in some places the road did not seem very stable, saw a moose, many elk and big horned sheep, hiked up to picturesque lakes, along streams and mighty water falls, along an old Ute Indian trail in the tundra, and to the top of a mountain. We ate dinner one evening with my nephew and his family who live on Storm Mountain, near the little town of Drake. 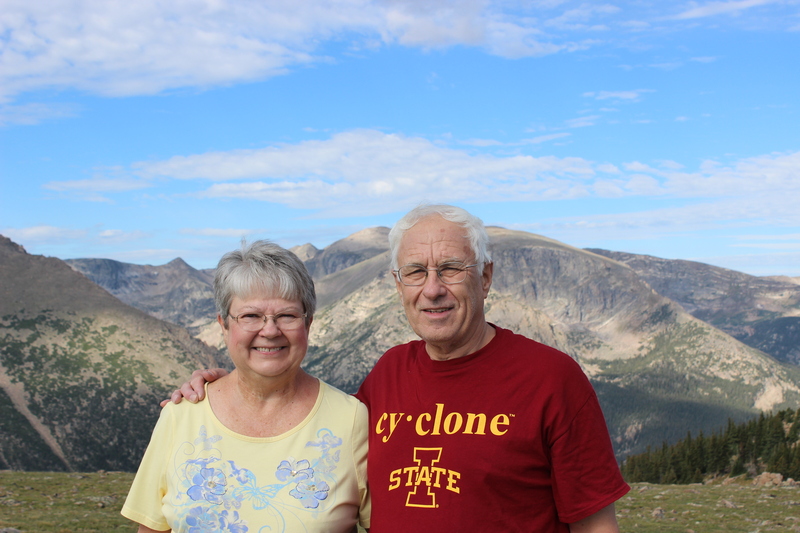 We listened to a ranger program, became closely acquainted with downtown Estes Park where we ate every evening, and listened to the Big Thompson River flow right past our cottage as we slept every night. While we experienced a few afternoon showers, mostly we dodged the rain drops and had great weather. Dave took hundreds of pictures. Though exhausting, we had a great vacation. The night we got home, before going to bed we pulled out three photo albums filled with the memories of previous trips to Estes Park and Rocky Mountain National Park. Oh, what fun to relate what we had just seen and experienced with our previous visits. Of course, there was no way we could ever imagine the events of the next week. On Tuesday morning, September 10 I received an email from my nephew saying it was a good thing that we had visited the previous week, as that morning was rainy and foggy and more rain was predicted. Little could anyone have imagined what was coming next. The rain didn’t stop. The Big Thompson River flooded, as did several other rivers. Estes Park was flooded. People had to be evacuated. My nephew and his family were stranded in their mountain home for several days before they were lucky enough to be evacuated by Chinook helicopter. Many roads and bridges are completely washed out. For a while the only escape route for people in Estes Park was over Trail Ridge Road, which will likely be closed soon due to fall snows. Rocky Mountain National Park which is generally open 24×7, is closed. Officials say that it will take a year or more to get the infrastructure repaired.